Many factors go into calculating value of a home. Most importantly, recently sold comparable properties must be considered. “Comps” should be similar in location, size, style, room count, condition, utility, etc. Appraisal is part art and part science, and the latter is hard to change. Sometimes, the hardest thing for owners is to be objective about their own homes. Always realize the appraiser is limited to the true comps available, and those comps will not always support the value you may expect. To influence the “art” part of the equation, keep your home in good condition. Present it for appraisal as you would for sale. Prepare written information regarding improvements, and offer an extra copy for your appraiser to keep. 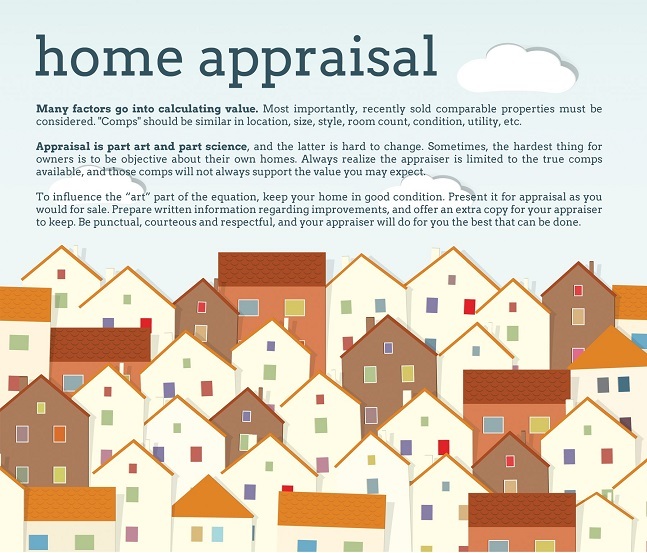 Be punctual, courteous and respectful, and your appraiser will do for you the best that can be done. Lenders must use a management company to handle their orders and in most cases loan officers aren’t allowed to contact or talk to an appraiser about the value or results. If the appraisal isn’t satisfactory and there is a doubt in finding comps or the value, we can provide additional comps that the appraiser may have overlooked and management company will contact eh appraiser with those and ask for reconsideration.